Propeller on a modern mid-sized merchant vessel. The propeller rotates clockwise to propel the ship forward when viewed from astern (right of picture); the person in the picture has his hand on the blade's trailing edge. 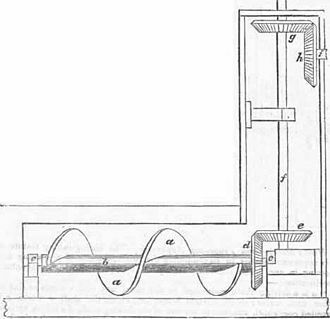 Smith's original 1836 patent for a screw propeller of two full turns. He would later revise the patent, reducing the length to one turn.